Olga Glebova came from the province of Pskov. In 1907 she married the artist Serge Sudeikin. She danced at the Maly theatre and played Columbine in Meyerhold's "Columbine's Scarf". In 1912 she danced in the ballet "The Fauns" by Ilia Sats. Around 1913 she was the central figure at the cabaret at the Stray Dog in St. Petersburg. In that year, the young officer Vsevolod Kniazev, who was also a poet, killed himself because of her. At the time, his rival was the poet Alexander Blok. During the same year the avant-garde composer Artur Lourié was her lover. In 1918 she divorced Sudeikin. Her best friend was Anna Akhmatova, who based the main character of "The Poem without Hero" (1940-1965) on her. 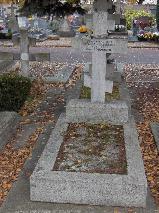 The grave of Olga Glebova-Sudeyikina at the Cimetière Russe, Ste.-Geneviève-des-Bois.